Decorating does NOT have to be difficult! 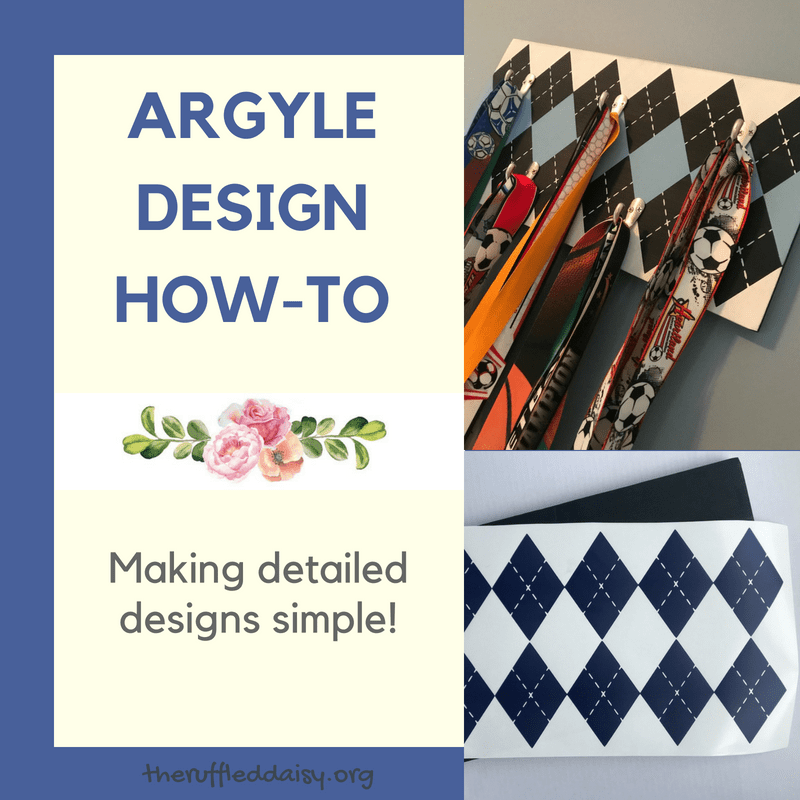 Take this Easy Argyle Design DIY for example! We see busy and intricate designs all over the decorating world and recreating them on your own seem insurmountable sometimes! You have the chevron, the herringbone, and the argyle, just to name a few! I was commissioned to decorate this room for a makeover that Leanne Lee at Diva of DIY was working on. She did all the behind the scenes work and getting the walls ready for me to add my touch to. Let me tell you, this was a FUN project! Plus I got to hang out with Leanna which doesn’t happen near enough in our busy lives. 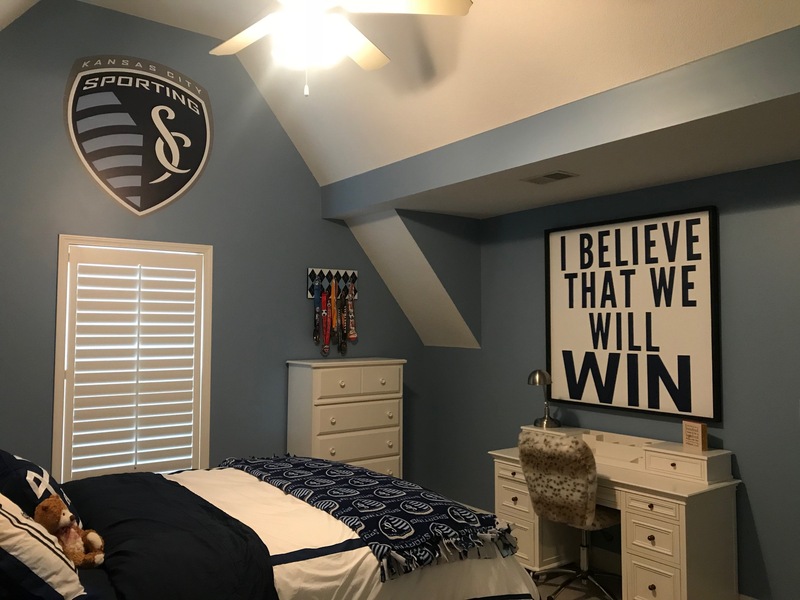 The little girl wanted a Sporting KC themed room since she is an avid soccer player herself. 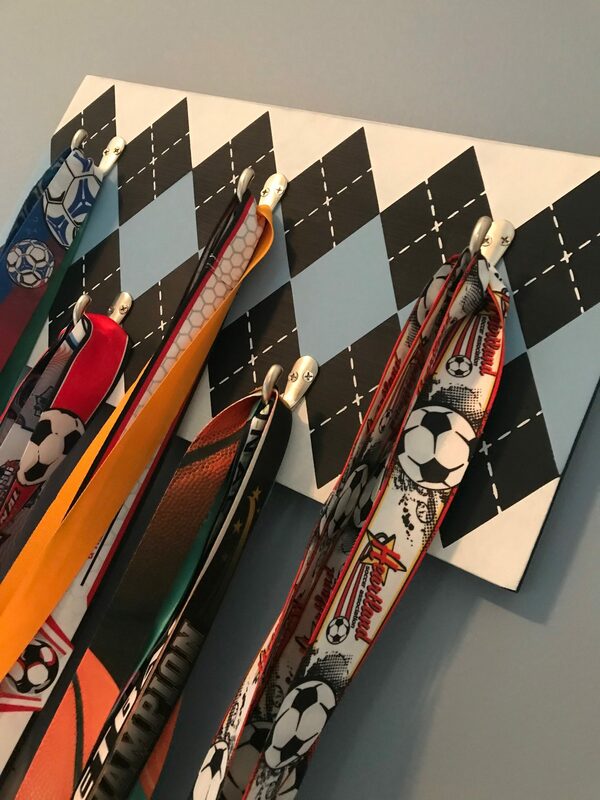 She wanted an argyle piece to hang all of her medals on – and let me tell ya, there was ALOT. WE could have actually went with two of these to display in her room because there were so many. 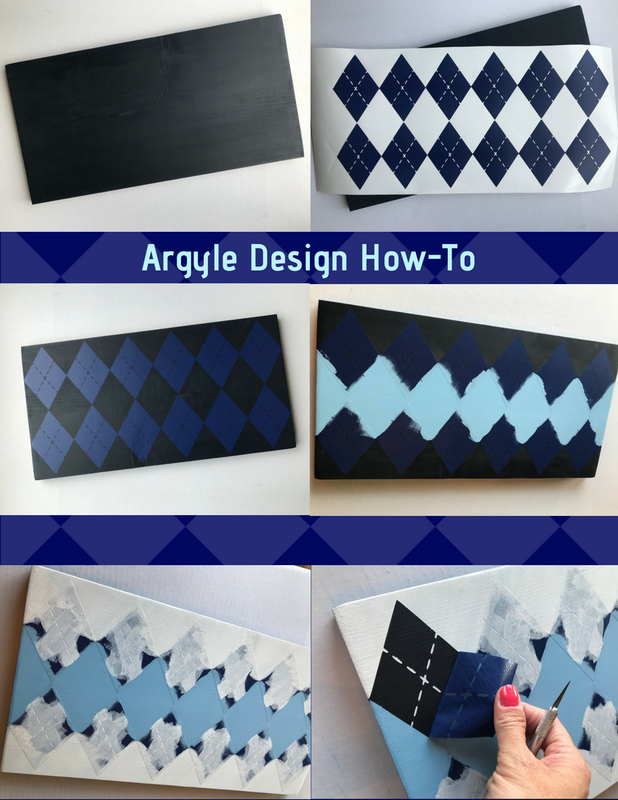 Check out this Easy Argyle Design DIY! As you know from previous posts, I LOVE my Silhouette cutter. This little machine makes creating detailed design so simple and achievable! I cut out a simple argyle design and used it as my stencil. 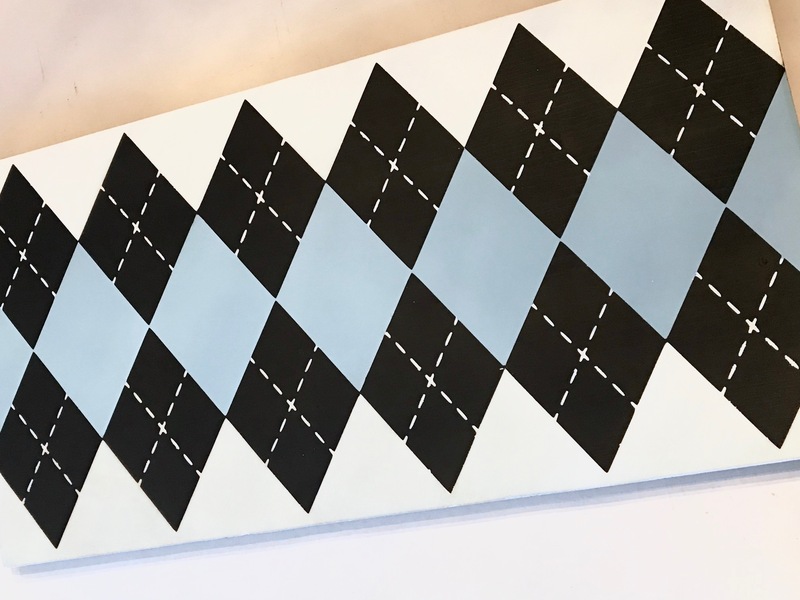 The base of the board was painted a dark navy color that matched the Sporting KC logo colors. Once the stencil is in place, I painted the middle section of the board a light baby blue color. Then all of the remaining spots where the board was showing, I painted white. When all of the paint it dry, you can remove your stencil/vinyl design. Using highly detailed designs in decorating CAN be easy! This is a piece that looks like it took a lot of work, when in fact, it didn’t. Those are my favorite projects!! 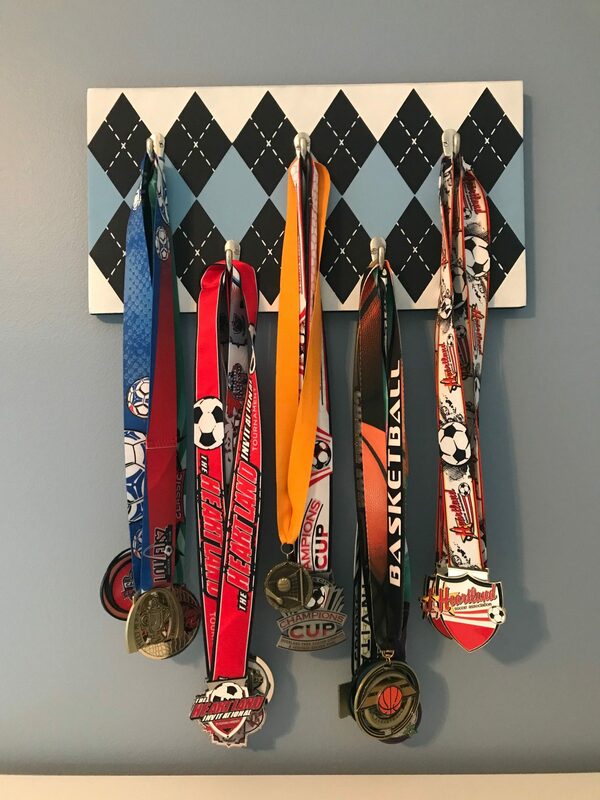 Next up, I staggered some silver hooks to hang medals on and attached it to her wall with Command velcro strips. These are lifesavers for me when it comes to decorating! Just make sure when you are buying them that you buy the right size based on the weight of your piece. Here it is in it’s home and displaying the amazing medals that this girl works so hard for! Pretty amazing, isn’t it? AND it’s something that you can do in a weekend! This Easy Argyle Design DIY doesn’t seem so intimidating anymore, does it? And that HUGE 4 foot sign?! MY FAVORITE!!!! 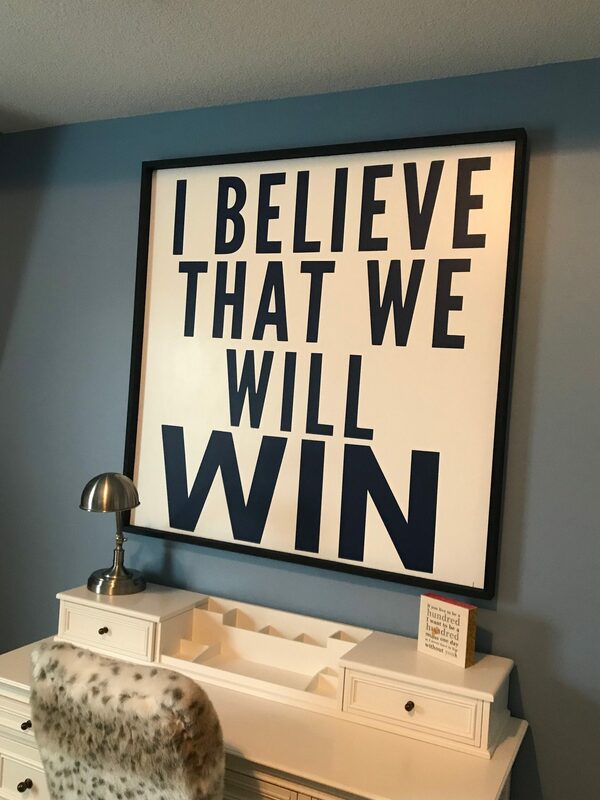 I loved working on this project and being able to see my pieces in someone’s home when it all comes together. 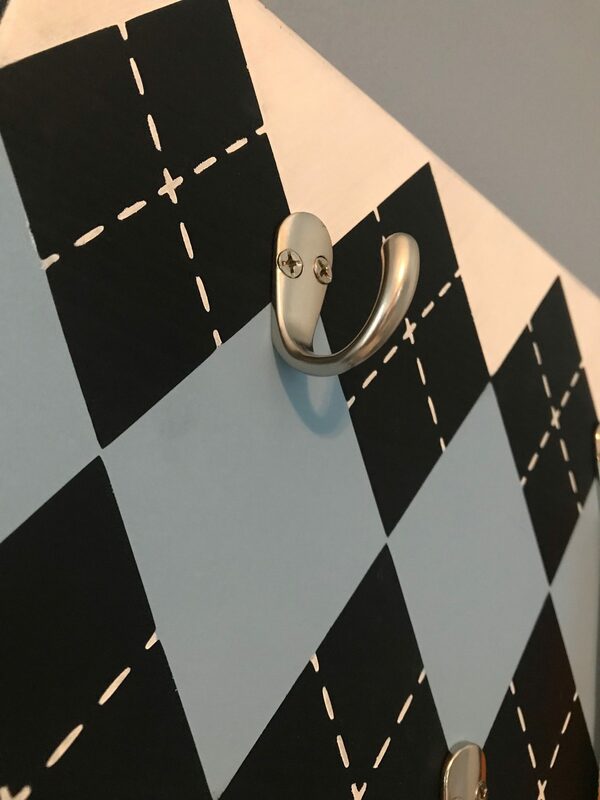 Do you like the argyle design? What is something you would use it on? I’d love for you to PIN this post so you can come back to it when you are ready to start creating something on your own. 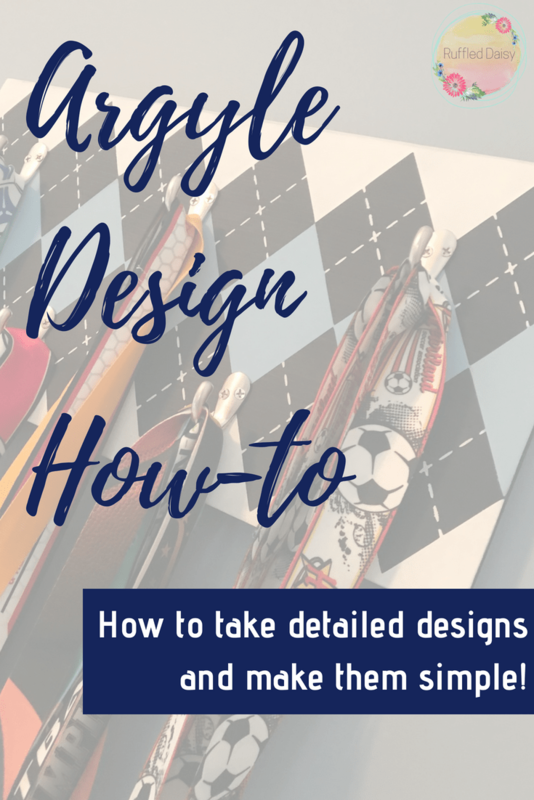 Don’t let difficult and detailed designs intimidate you! YOU CAN DO IT!! I’d LOVE to see if you create something on your own based off of this post!